Now this is a really good idea!! I discovered variable overdrive through using a volume pedal to swell signal into an overdrive stomp box. But I never really caught onto its possibilities until I bought my Axe FX, which allows you to control any effect using an expression pedal. In the Axe, I was able to link the overdrive parameter of the OD unit in the signal chain to the expression pedal, and so swell the amount of overdrive up and down without affecting the volume (or doing so at the same time with volume, delay, flange, chorus and any other effect in Axe’s palette). 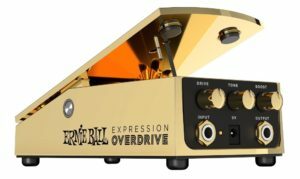 So combining effects with an expression pedal as Ernie Ball are now doing with their industry standard pedals, makes a lot of sense. The Ernie Ball expression and volume pedals are very high quality – hence being the ‘industry standard’, especially for people like steel guitar players. Smaller effects rigs where you don’t want to use many pedals, could become even easier to carry and use. I haven’t tried their OD unit. But I hope it’s a really flavoursome example like the Crowther Hotcake or EHX’s Big Muff!! Next story Recording, New Band & PERCY!